Ossett Feast at Gedham Field, which was located close to Gedham Mill at the bottom of Kingsway, opposite the Lidl Supermarket. All the fun of the Fair with ice cream, lollies and candy floss. Feast weeks or wakes weeks were an annual feature of life in cities, towns and villages especially in the north of England. Originating as a religious celebration or feast it developed into a week when factories and schools closed and the workforce took a week off, usually unpaid, to take their families away for their annual holiday. The week often began with a fair which itself became known as the feast. The expansion of the railways made for ease of travel to seaside resorts on the east and west coasts but the decline in manufacturing industries and other technological advances saw the tradition steadily disappear in the second half of the 20th century. 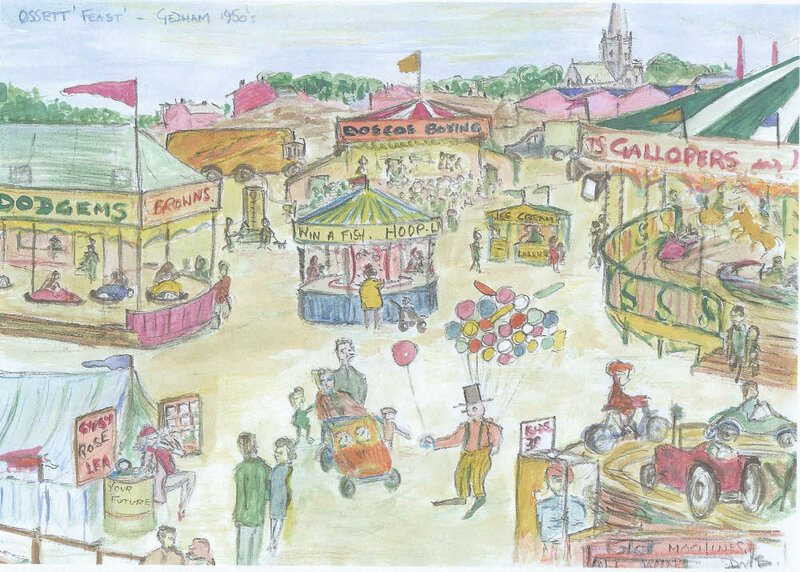 In Ossett’s case the feast was held at Gedham, the area behind the Cooperative Store and the sketch displays the variety of stalls and entertainments which catered for Mums, Dads and children. How many romances began, and perhaps ended, at Ossett Feast?